On Anna's 6 month birthday, we celebrated by giving Anna her first solid food. The overprotective mommy in me took over and I was constantly worried and wondered if we rushed into it. I made the transition from exclusively pumping and Anna getting mostly breastmilk to her being exclusively on formula. There's still some guilt involved in whether or not this would be the best decision, but I really couldn't keep pumping anymore. Having that much more time in my day is quite liberating. But I digress. I decided on giving her green beans first and she was not interested. She begrudgingly took what I gave her while making faces, gagging, and finally was too upset that I just couldn't go on. I still continued each day to try at it, every so often trying something new. We went through green beans, peaches, and avocado. Then, on a random whim I bought some organic peas baby food. She made the sort of same reaction she did with the other foods, but after awhile, she decided to keep going and even leaned in for more. I was overjoyed. Though she still doesn't seem to care for solid foods. While at Ty's parents' house, Cheryl tried giving her some banana and she made a sour face. This girl! Cheryl then suggested using a fresh food feeder with some watermelon in it since Nathan and Celia's twin boys took to it so well. She loved sucking on it! Hooray! However, I tried it again with no luck. She wouldn't even pick it up. Teething started really showing what it can do though, mostly it's discomfort and lack of sleep for her naps during the day. She caught a cold a couple of weeks ago and it was so sad and pathetic. I did enjoy the extra cuddles, but I never like seeing my baby in discomfort. We went through almost an entire box of tissues that week. She eventually in lost her sweet little voice and that was the worst of it all. Luckily, even through it all she was a happy girl and quickly returned to her normal self. - She can respond to her name! I love when she looks at me after I say her name. She will also look to us if we say "Baby". I'm trying to not use that so that she will associate her name with herself better, but sometimes I can't help it. She's my baby! - Now that she is able to roll over both ways she has had more ability to move and practice getting to where she wants to go. She started doing this funny little thing where she gets on her hands and feet. Almost like a yoga "downward dog" position, except she keeps her head up so she can see everything. She's one curious little lady. - Ty has a little "Kip" (from Napoleon Dynamite) that talks when you push his middle. In an effort to distract her in order to get ready for church, Ty let her play with it. The head is the only part of the "action figure" that isn't plush and she loves to mouth it. She also laughs just about every time we push him to talk. When in doubt turn to Kip. It's so funny. - She loves the sound of the camera makes on my phone. So I now, finally, am able to catch this girl with a smile when taking pictures. She's a pretty stoic baby so getting her to smile is kind of a big deal. 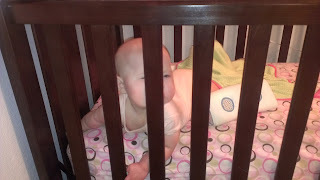 - You'd think by the way she acts during diaper changes (messy, wet, both) we were torturing her to death. It's quite possibly the worst thing in our lives right now. - As I mentioned before, she's pretty stoic. There are few people or circumstances that can make her break a smile outside of mommy and daddy. This makes handing her off to people who are kindly offering to help just about out of the question. In some cases, it's a necessity for someone else to hold her and we all must suffer through the screaming fit, but generally I try to avoid the situation all together. - Rash...still there. Not cool. It's mostly on her shoulders and back now. I hate it. It itches for her and she can't help it, but to scratch because she doesn't understand the implications. I hope we can get this figured out soon. - We're still working on the naps situation. Mommy needs them....I mean she needs them....Mommy needs her to need them. Can you believe it? My baby is 6 Months Old! Time went by so fast. In some ways I'm glad because seeing her develop and progress is wonderful. On the other hand though, I miss that precious little snuggle bug. She went from helpless and completely dependent to curious and an active mover in the blink of an eye. I hardly recognize her as the same baby. But she is and we love her more and more. After six months, I decided to read her birth story again. Oh my goodness! Did I really experience all that? There's definitely some things my experience showed me that I will do differently when we have our next child. I still want to do a home birth, but I think there's just a few things I think I'll try to make sure to do like eat more protein and do a better job of trying to rest. We'll see if that happens though since now I have this little munchkin to occupy my time. 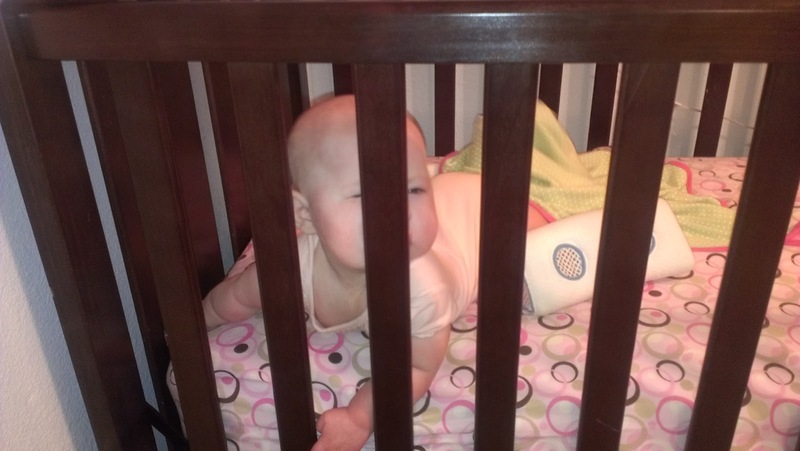 I mentioned last month that her day time sleep was really not going well. At night she was fine, but during the day she was only taking catnaps. I couldn't understand what was the deal. People would ask me if she was teething, but she was still happy and there were any teeth that I could feel coming through. 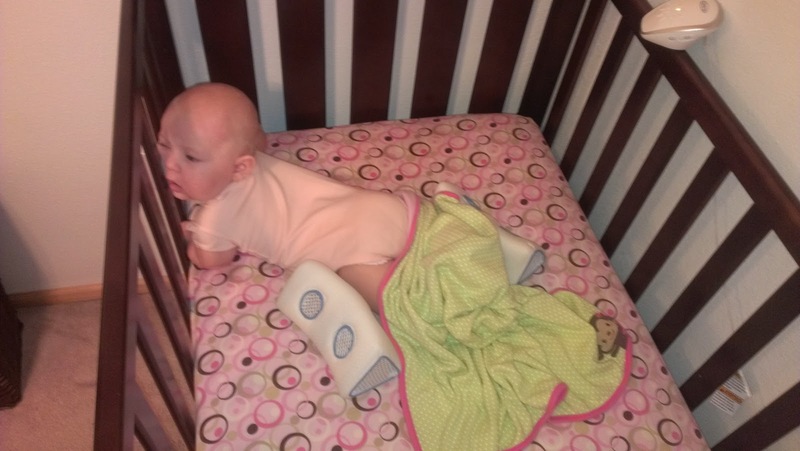 She didn't cry when she woke up, so we would try to just leave her in bed and see if she would go back to sleep. When that didn't work, I really felt at a loss. How was I supposed to get anything accomplished? On Ty's birthday weekend, we talked with Nathan and Celia about the new Sleep Sense program they were using with their kids. The twins had gone from waking up every hour to nurse to only waking up about once or twice a night. I had to give this a try. We were still waking up Anna to feed her before her final bedtime and we were wiped out by it because it put us going to bed super late. In addition to being outside, Anna is a lover of the water. She loves to kick and splash and see what happens. It's absolutely fascinating to her. Bath time is definitely a happy time. I bought a small toddler pool and she loves being in it outside. She would stay in there all the time if we let her. We also got a different tub that she can sit up better in. The infant one was becoming more and more too small for my long baby girl. She loves to kick and splash and flail about. If in doubt, put this girl in water. On her the day she turned 6 Months we decided to try starting her on solids. She shows so much interest while we eat and watches every move of the food. From the plate, to the spoon, to our mouths. It's so funny how captivated she will be with it. I decided to try Green Beans as her first food and made the effort to make the baby food myself. The making of the baby food was a great success and I will definitely continue to try with any foods that don't take much effort. However, the actual eating of the baby food was not as great of a triumph. We'll keep at it and hopefully in time she'll learn to love it. Or at least tolerate it. - We love finding all the new ways to make her laugh and giggle. It's the best game. We've recently discovered that she is ticklish just above her bum. - She's been making the funniest faces lately and I'm really not sure what brought them on, but we've definitely been enjoying them regardless. - Teething is no fun and I feel so bad for her. There's not much we can do, but I try to give her Camilia when she gets overly cranky and I have some teething circles that can be frozen to help relieve the pain as much as it can, but those little chompers came in quick. They continue to grow so fast that I can hardly believe how far out they poke already, since we only just discovered them two weeks ago. - She started rolling over to her belly while in bed. Sometimes, just as we set her down. She HATES being on her tummy so this is somewhat counter-productive in her case. At first I was concerned she would never get any sleep and obviously worried about SIDS. Then realized that she would be fine because there wasn't anything restricting her airflow and she was going to have to figure out how to soothe herself at some point because I couldn't always come to the rescue.